I already know you’re going to love it, but now I’m asking you to list it. From now until December 2nd I want to see social media covered with pictures capturing bucket list experiences. I’ll choose a winner at random to win the ultimate prize bucket of goods…all related to my novella, THE SHORT & SINCERE LIFE OF ELLORY JAMES, releasing November 2nd. Whether you’ve already completed the item on your bucket list or now is the perfect time to do so, get out there and make memories. 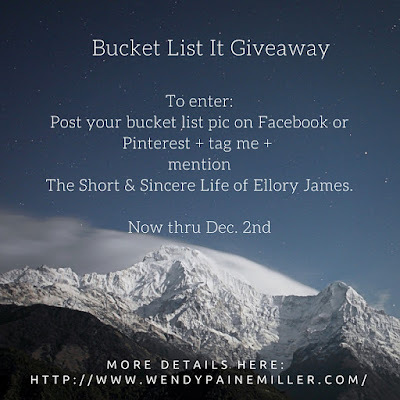 Post a picture from your life-changing experience on social media + tag me in it, mentioning the upcoming release of Ellory James and you can consider yourself entered. While I know there are dozens of wonderful sites to show off your photos, I’m focusing this giveaway via Facebook and Pinterest. It’s time to BUCKET LIST IT! More details about uber cool items in giveaway bucket to come! So much to look forward to! *thanks Emily M. (for you know what). **If you're not the bucket list type, feel free to share the giveaway details by using the graphic above.